Sofu Teshigahara founded the Sogetsu School in 1927, choosing a completely modern approach to Japanese flower arranging. After the close of World War II, Sofu had a dramatic influence on Ikebana with avante-garde arrangements using driftwood, metal, concrete, and other unique materials. Before this, only plant material was used in arrangements. Sofu traveled the world presenting one-man shows to bring the art of flower arranging into the Art World. The Sogetsu School had a rapid development because of his contemporary methods. Now all schools – over 400 of them- offer new and modern styles to their students. Succeeding Iemotos made individual contributions: Kasumi Teshigahara expanded her creativity with miniature creations and feminine, graceful works. Hiroshi Teshigahara presented huge bamboo works. The current Iemoto, AkaneTeshigahara, has introduced ikebana performance as fusion with dance and music. All have continued to move the bar to new dimensions. 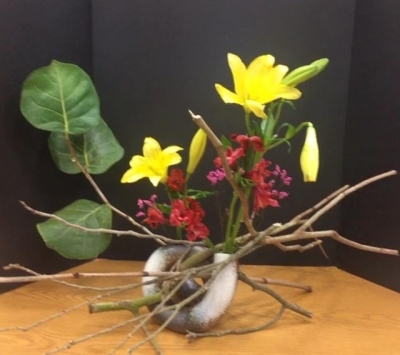 The four principles of ikebana are a fresh approach, movement, balance and harmony; the three elements are line, color and mass. 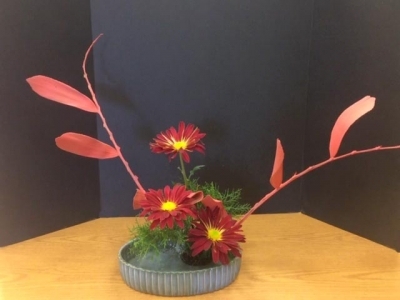 Sogetsu Ikebana can be created anytime, anywhere, by anyone in any part of the world and with any kind of material. Images of Sogetsu School Arrangements: Current Student and Sensei Photos from Oct 2018 are included in this Gallery. To change to slideshow, click link. To save any image, double left click to enlarge it and then right click on it and “save as” to your device. The images presented on this website are for educational and inspirational purposes only. For more information, please visit the link to the Sogetsu website.